We barely have made a dent in the new year, and already we have a candidate for one of the best books of 2016. 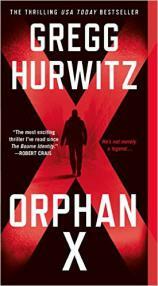 It is ORPHAN X by Gregg Hurwitz. Some words about Hurwitz: He seemingly has been incapable of writing badly since he first came out of the gate, well over a decade ago, with THE TOWER. He has written thrillers, graphic novels, film and television screenplays, and scholarly nonfiction works (which we will not hold against him). However, none of that will prepare you for ORPHAN X, which will keep you reading all night and through the day. What a great ride it is. "ORPHAN X is the start of what looks to be an amazing new series. Surprises and suspense abound throughout, while the plot is peppered with major and minor characters who stick in the memory whether present from first page to last or only for a few paragraphs." Evan is very much a quiet but deadly angel who intercedes on behalf of those who are without power or control of their own lives. Meanwhile, he lives a seemingly quiet life in a penthouse condominium where his neighbors believe he is a highly paid consultant of some sort or another. Evan picks his own assignments, if you will, secure in his anonymity and the knowledge that he has left his life in the Orphan program behind. However, all of this explodes when Evan’s attempt to help a woman troubled by insurmountable gambling debts goes wildly wrong. The result? Both he and the lady find themselves being chased after by a very skilled and determined team of pursuers. As the narrative unfolds, it alternates with flashbacks to Evan’s past, which delve into his training, including the rules --- ones that Evan refers to as the Ten Commandments --- which, under the careful supervision of Johns, led him to develop the skillset that he possesses. They also reveal Evan’s gradual disenchantment with the Orphan program, which was designed by the United States in the 1990s to develop a highly skilled group of solo, offline covert spies or “assaulters” performing missions as cutoff men, operating with totally plausible deniability and funded via a black budget washed through a minor cabinet department. When Evan left the Orphan program --- a major no-no --- he thought he had covered his tracks well. The sins of the past, though, are manifesting themselves in Evan’s present. Furthermore, his efforts to empower the powerless are about to blow back on him in ways that he never expected. By the end of the book, much that has been hidden will be revealed, while some additional surprises undoubtedly will echo beyond its startling and exciting conclusion. ORPHAN X is the start of what looks to be an amazing new series. Surprises and suspense abound throughout, while the plot is peppered with major and minor characters who stick in the memory whether present from first page to last or only for a few paragraphs. Hurwitz’s mad screenwriting chops are at play here as well; the narrative unfolds with such cinematic brilliance that one can almost see and hear the action exploding off the page. Jump onto this series now. You’ll thank me later.